Donald Trump doubled down his crusade against America's trade deals and his attacks on automaker Ford and air conditioner company Carrier. 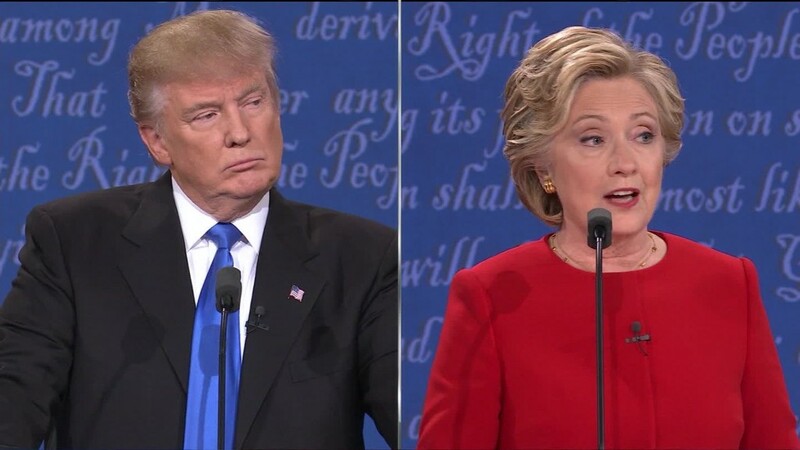 "NAFTA is the worst trade deal maybe ever signed anywhere, but certainly ever signed in this country," Trump retorted to Hillary Clinton on Monday night, referring to the trade deal between the U.S., Mexico and Canada. Trump also reiterated his attack on Ford (F), accusing the car maker of moving American jobs to Mexico. "Ford is leaving. You see that, their small car division leaving. Thousands of jobs leaving Michigan, leaving Ohio," Trump said. Ford hammered back in real time via its official Twitter account on Monday night, repeating that no U.S. workers are losing their jobs when it moves production of small cars to Mexico in 2018. "There is no impact on U.S. jobs. Ford's American workers will build 2 new vehicles at the U.S. plant where small cars are made today," Ford tweeted. @eschulze9 There is no impact on US jobs. Ford's American workers will build 2 new vehicles at the US plant where small cars are made today. Trump continues to make trade a focal point of his campaign, and it's the number one thing economists criticize him for. Trump consistently rails against NAFTA and the companies that benefit from it. NAFTA became law in 1994 under President Clinton and it eliminated almost all taxes on goods sent between the three countries. Trade has boomed between the nations since 1994. Trump blames NAFTA for destroying America's manufacturing sector. Today, there are about 12.2 million manufacturing workers, down from 17 million in 1994, according to the Labor Department. To be sure, all of the 5 million jobs weren't lost to Mexico and China. Improvements in technology have eliminated lots of jobs too. And American manufacturers are in fact more productive today than they were back in 2000. Adjusted for inflation, U.S. manufacturing output totaled $5.90 trillion in 2000. Last year it hit $5.94 trillion -- a tick above -- even with fewer workers. Experts say that means that there's been a decline in demand for low-skill labor but not a decline in demand for manufactured goods in America. "It's just nonsense to say NAFTA is responsible for the decline of manufacturing jobs in the U.S." says Alan Deardorff, an economist at the Gerald R. Ford School of Public Policy at the University of Michigan. Congressional research agrees. An analysis of NAFTA's economic impact found that it didn't cause a mass exodus of U.S. jobs. Instead, it found that NAFTA had a small, positive impact on the U.S. economy. Although Trump labels NAFTA as a deal that only benefits Mexico, about six million U.S. jobs depend on trade with Mexico, according to the U.S. Chamber of Commerce. For example, some U.S. businesses that ship goods to Mexico, like denim manufacturers in South Carolina, say they would be out of business if NAFTA didn't exist because they don't have to pay a tax to send their products. On top of exporters, all Americans benefit from cheap prices for all types of goods -- from t-shirts and jeans to cars and air conditioners. Some manufacturing jobs have certainly been lost to Mexico, so Trump does have a point. But exactly how many jobs, is highly debatable and hard to pin point. One economist, Robert Scott at the Economic Policy Institute, estimates the U.S. lost about 800,000 jobs to Mexico between 1997 and 2013. However, other economists criticize Scott's number because it isn't a head count. Scott calculates the number based on the size of the U.S. trade deficit with Mexico. They also argue that it's very difficult to count exactly many jobs were lost to Mexico. Trump has threatened to put a 35% tariff on some goods made in Mexico and sold in the U.S. Economists and trade experts across the board say this would be very negative for the U.S. economy. They argue that Mexico would retaliate with tariffs on U.S. goods, hurting American exporters, and that Trump couldn't guarantee that he would "bring back" the jobs from Mexico as he's promised. "It would be a disaster," says Deardorff.